I’ve decided to strike out on my own doing what I love and working for myself! 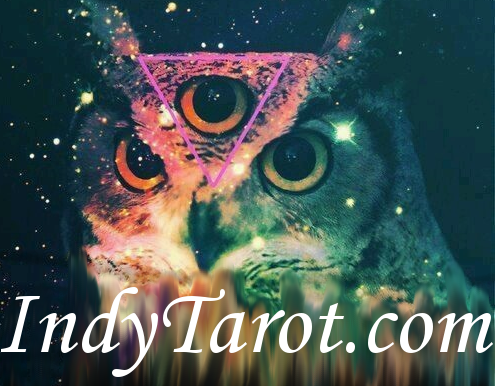 I’m so excited to share my new business, IndyTarot.com with you. Thank you to all of my fans and supporters who have believed in me through the years, and who have given me the courage and strength to make this dream happen. I have some exciting ideas for the future of this business. I hope that this can grow into something that we can all love. For now, I am very grateful for your encouragement, and I’m looking forward to reading for you again! 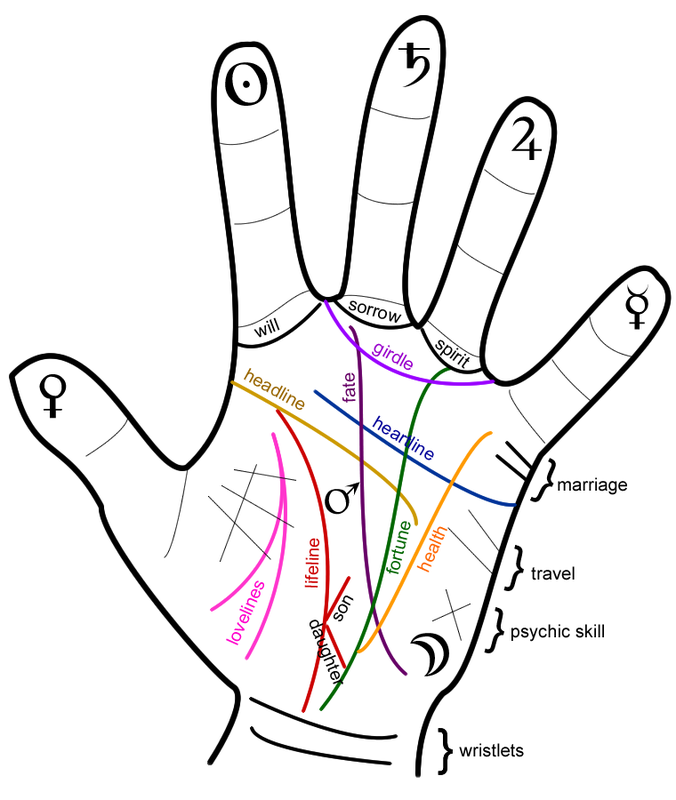 Palmistry, or Chiromancy (pronounced "KYE-roe-man-see" and named after Leich de Hamong/Louis Hamon, the famous nineteenth century palmist who also went under the name of "Cheiro") is an ancient way of divining. It was common during medieval times and is known to have existed when Greece and Rome were at their height. Your palm changes throughout your life. Although your hand gives an outline of your life, it is only a tentative outline. As with all divination, just because it is set in your hand, does not mean that it is set in stone. You can change your palm by changing your life. 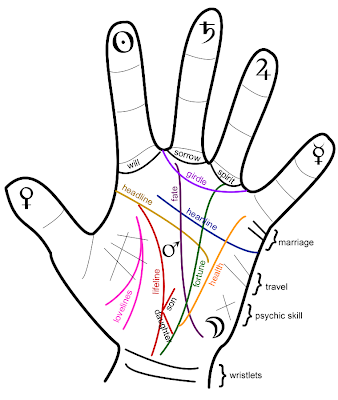 Generally, the dominant hand -- the hand used for writing -- is the hand used during a palm reading. It marks a person's fortune as it exists on this plane. The passive hand represents events relating to the person's Great Work, or their fate. Before making any strong pronouncement about a person's life, check that the event is marked in both palms. If it exists only in the dominant hand, steps can be taken to prevent the occurrence. If it appears only in the passive hand, steps have already been taken to avert the issue. If a person is ambidextrous, use the right hand as dominant, and the left as passive. The lines are looked to as the major source of information in the palm. thick, deep, well-colored, unbroken lines represent positive qualities. Thin, broken, "chained" lines with weak circulation denote poor qualities. Networks of many lines in a hand -- like a spiderweb -- shows a person cautious about life, who is usually guarded. Strong, clear lines, with only major lines dominating the palm are the mark of a straightforward, boisterous person, comfortable with themself. The lifeline wraps itself around the base of the thumb, beginning near the headline, and ending near the wrist. The point where the lifeline separates from the headline shows the point of "breaking away" from the subject's birth family. If this section of the line is chained, the birth family was a source of strife. If the lifeline is completely separate from the heartline, it is a sign that the subject was not close to their family. The lifeline is measured from the thumb-forefinger crease to the wrist. Early events are shown earlier in the line. Late life events will be closer to the wrist. The strength and length of the lifeline show the health and longevity of the subject. a long lifeline reaching down to the wrist is the sign of a long life. A weak line shows poor health and constitution. A break in the lifeline should be examined in both palms, as this may be a sign of grave illness or sudden death. Lines reaching off of the middle of the lifeline either up or down may represent children, male and female, respectively. The headline and heartline should always be examined together, as one may be more dominant in the palm than another. If the headline is dominant, it denotes a sensible, logical person, who may be a bit cold emotionally, and prone to obsession. If the heartline is dominant, it shows a sensitive, caring person, prone to emotional outbursts and heartache. If the two lines are in balance, the person has a healthy balance of their mental and emotional capacities. The headline is measured from the thumb-forefinger crease to the mount of the moon. A strongly psychic person may have a headline reaching well onto the mount of the moon, often overlaid by X's and triangles on the mount. The heartline is measured from the crease under the pinky finger to it's end near the finger-mounts. The heartline sometimes branches near the end of the line (this appears as a Y shape in the palm). This may be an early warning of mental illness in later life, or it may be a clue to the emotional nature of the subject. Examine which finger the "branch" reaches toward. The planetary nature of this finger shows the emotional issues that most occupy the subject. The line of fate is measured from the wrist to the fingers, and runs almost vertically, bisects the palm. The finger of Jupiter, which it reaches towards, influences the line of fate. It is used to measure the subject's finances and divine luck. Observe the mount of mars when examining the line of fate. If the line of fate firmly connects the headline and heartline, making a clear "M" along with the lifeline in the middle of the palm, it is the sign of financial success. The more strong and clear the "M", the better the financial situation. A line connecting the lifeline with the line of fate near the wrist denotes an inheritance of some nature. The line of fortune begins near the line of fate at the wrist, and reaches toward the ring finger. If the line of fortune connects with the line of fate, it shows that financial success will come from hard work. The line of fortune is sometimes known as the career line, as smaller lines branching off of it show changes in the career. The line of health begins near the line of fortune, and reaches toward the pinky finger. A strong line of health shows great health and vigor, and also a natural charmer and great communicator. A weak, broken line of health often shows a sickly nature. Rings appear to encircle the mount of each finger, just below the creases where the finger naturally bends. A ring of the Sun indicates great strength of Will, with the drive and ability to influence others. A ring of Saturn indicates sorrow and a tendency to desire what is beyond current means. If the ring of Saturn cuts into the line of fate, this is doubly so, and the individual will send their life feeling as if the world owes them something. A ring of Jupiter indicates a deeply spiritual person. If this ring is present along with positive markings on the Mount of the Moon, this indicates an individual with great potential for occult study. Dramatically strong, yet short offshoots from the lifeline indicate children. Lines of this nature pointing up towards the fingers indicate sons, and lines pointing down toward the wrist indicate daughters. Birth order may be determined by moving down the lifeline towards the wrist. These birthlines can also indicate the completion of a large life goal, or spiritual birthing, if the individual is childless. Lines encircling the wrist indicate the longevity of the individual. Each wristlet counts as roughly twenty years of life, and each partial wristlet counts as ten. Running parallel to the lifeline on the mount of Venus are the lovelines. Each loveline shows a great romance in the subject's life. Often only one loveline will run nearly the entire course of the lifeline. This is the sign of one true love in life. The subject will meet the lover shown in relation to the loveline's appearance along the lifeline. Different from the loveliness are the lines of partnership, which occur in the percussion along the side of the mount of Mercury. The lines of partnership indicate both great loves and great friendships, and often point ot marriage. Stretching across the mounts of Saturn and Jupiter, the girdle of Venus is an indicator of a highly sensitive and intellectual nature; however, such sensitiveness renders the bearer moody, touchy, and easily offended. It is often seen in the hands of high-strung, suspicious, and anxious people. If coupled with a fleshy mount of Venus, the girdle shows a highly sexual nature. A grid occurs at a point of the palm where the energies that area dissipate. If a grid covers the entire palm, the power of its bearer is constantly drained by vexations and imagined slights. If a grid appears on a mount, it saps or thwarts the qualities of the mount. Crosses denote troubles, disappointment, danger, and when found on lines, the harm to the bearer may be aggravated. Occasionally it can refer to a dramatic change in one's life due to a crisis or hardship. A cross is only favorable when it is located between the head and heart lines, when it is referred to as the "Croix Mystique", and indicates a propensity towards mysticism, occultism, and superstition. A star is a symbol of great and sudden brilliance in a person's life. This brilliance is often arbitrary and unexpected, and is always an event that the individual can exercise little control over. A line that ends in a star signifies the greatest accomplishments possible; however, the star often carries with it an unpleasant price. A star on the mounts will naturally denote great proficiency with the mount's corresponding traits, yet these traits may consume some of the other bearer's qualities. A star in the palm indicates a need for Temperance in ones’ life. These negative influences can be seen as being “star-crossed”. The Island is always a negative sign. Unlike the star or the cross, the island is a gradual and prolonged, and often subtle period of strife in an individual's life. Because of the gradual nature of this malady, the bearer may not have even noticed that they are in a darker period of their life. These misfortunes will last to the extent that the island is long. The square is almost always a beneficent symbol. A square surrounding an ill-marked area signifies repair and eventual containment of the negative influences. The one instance in which the square denotes negative influences is when it is found on the lifeline, where it indicates incarceration. The circle is a very rare marking in chiromancy. It is an evil mark unless it is on a mount, in which case it usually augments the powers and promise of a mount. If it touches any line, it brings inescapable misfortune related to the line it touches. The triangle is nearly always a positive sign. It denotes success corresponding to the location of the mark. If found alongside a line, it will naturally take on significance dependent upon the line, marking a point at which accomplishment is achieved. The triangle will never reach the great heights of success that its cousin, the star, but it possesses balance and will not carry with it the backlash that so often accompanies the star. The chain, like the island, is a negative sign. Chains bind up the energy of the lines they occur on, and can be seen as islands linked together, presenting new obstacles arising from past negative influences. The trident is always a positive marking. If it arises from a line, it will increase the qualities of that line and draw additional power from the mounts or lines that the branches on either side point towards. If it is found on a mount, the trident increases the properties of that mount in conjunction with its neighboring mounts. The trident is such a powerful symbol that it eclipses the star in beneficence, as it has none of the ‘star-crossed’ energy related to that marking. There are many different ways to use the tarot cards. They can be taken as a whole telling the story of the Fool's Journey and they can be interpreted only a few at a time in order to divine an answer to a question or divine the future. 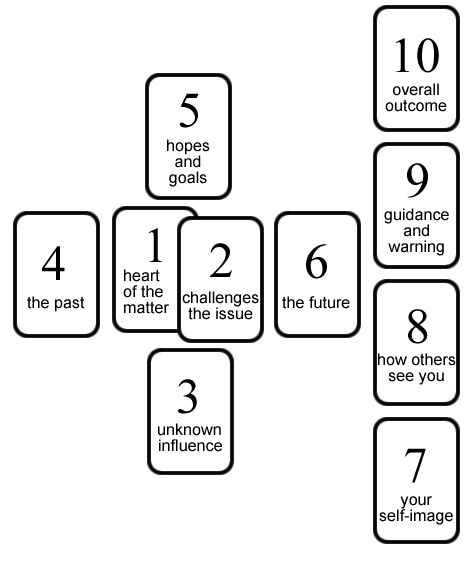 Below are several layouts for reading the tarot cards. The three card draw is Tarot “quick and dirty’. It is especially useful for confirming a longer reading. It has much in common with modern rune divination layouts. 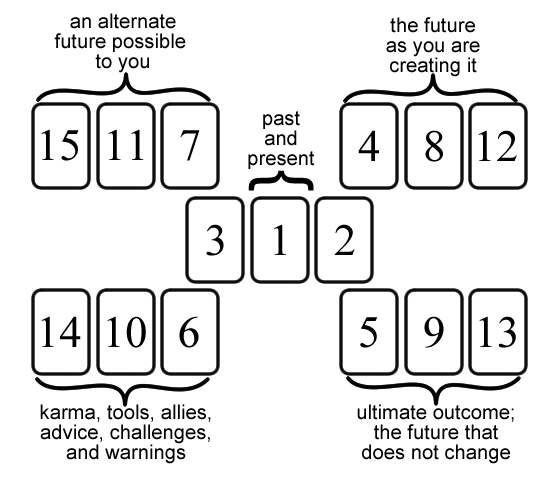 Some readers prefer a laying out the middle card first and then the cards on the left and right, but the cards are still read right to left as past, present, and future. You can think of the Celtic cross as divided into two sections: the Circle/Cross on the left, and the Staff on the right. The Circle/Cross section is made up of two crosses - a central one (card one and two) nested within a larger cross (six cards). The smaller cross represents the heart of the matter - what is most central to you at the time of the reading. It is the hub around which the wheel of your life is turning. The larger cross consists of two lines that overlay the mini-cross. The horizontal line shows time moving from your past on the left into your future on the right. The vertical line is your consciousness moving from your unconscious on the bottom to your conscious mind on the top. Together these six cards give you a snapshot of your inner and outer environment at the time of a reading. The Diana’s Bow spread is also known as the Seven Card Ellipse Spread, Diana’s Crescent, and the Seven Stars Spread. This layout is good for when you are asking about a project. The basic question that will be answered is "What is to be done?" It offers advice, guidance and warning, which is seen as the divine guidance of the Goddess Diana. This spread is especially poplar among the Romani or Gypsies. The dramatic fanning and slow turning of the cards is characteristic of this layout, and is also associated with Romani fortune telling. Shuffle the cards and fan them out in front you, face down. Draw seven cards from the fan. Do not turn them face up. Shuffle these seven cards and lay them out as shown in the diagram below. Turn them over, one by one, interpreting each card as you go. This spread is unique in that the cards are not to be considered as a whole until card four is turned. Then cards one through four may be examined together. Only at the end of the reading may all of the cards be considered together. 1. Turn over the first card: This represents the past, or that which is ending. 2. Turn over the second card: This represents the present. 3. Turn over the third card: This represents the future, or that which is beginning. 4. Turn over the fourth card: This represents the path to take and what to do. It is the counsel of Diana. Review cards one through four. How do they influence each other? 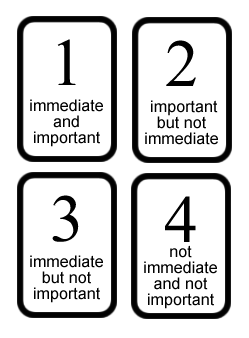 How does the advice of card four apply to cards one through three? 5. Turn over the fifth card: This represents helpful or harmful outside influences. 6. Turn over the sixth card: This represents hopes and fears. 7. Turn over the sixth card: This represents the final outcome. Review the cards together as a whole. How do they influence each other? How does the advice of card four apply to cards five through seven? Sometimes prioritizing our lives can be the most daunting task of all. This simple layout is designed to guide you towards what is most important and helps to point out what can wait. This is very useful for seeing where your energies are going. The 15 Card Spread layout, also know as The English Spread, is associated with Crowley's Book of Thoth tarot deck. It originated among the Golden Dawn. This spread is extremely helpful when at an impasse, or caught between several choices in one's life as it offers advice in the form of options. It is my personal favorite spread for giving readings. The fifteen cards are placed clockwise into four triads around a center triad. Each of these triads presents an aspect of the situation. Usually, the center card of each triad presents the general influences of the situation. The card to its left shows the mental and emotional influences of the situation, while the card on the right presents the physical and material aspects of the situation. Look at Cards 1, 2 and 3 to find out the central dynamic. This will give you an idea of what is going on in the person’s life, and what the reading is specifically about. Look at Cards 4, 8, and 12 to find out what direction the future is pointing to. 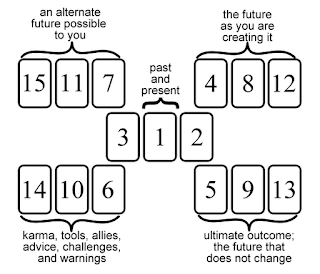 Look at Cards 15, 11, and 7 to discern an alternate choice for the future. Look at Cards 14, 10, and 6 to see how people and events are flowing through your life. Consider Cards 5, 9, and 13, the projected outcome. How do you feel about it? 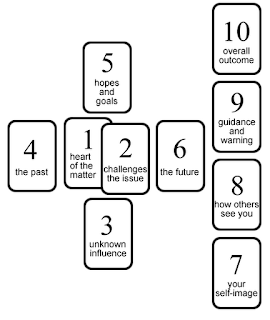 Review the cards to discover the factors leading to the outcome. Look at Cards 1, 2 and 3 review the theme of the reading. Compare cards 1, 2, and 3 with cards 4, 8, and 12. What about your current situation put you on this course of action? Compare cards 4, 8, and 12 with cards 15, 11, and 7. Which is more favorable? How can you change your course of action if needed? If your current course of action is favorable, how can you ensure that the less favorable future does not occur? Look at Cards 14, 10, and 6. How can these factors assist you in making the best possible decisions for your future? Consider Cards 5, 9, and 13. How do they work with the immediate future you are heading toward? How do they interact with the alternate future? What do they tell you about the resources offered to you in cards 14, 10, and 6? What are the internalized (emotional and mental) influences of cards 3, 4, 5, 15, and 14? What are the core influences of cards 1, 8, 9, 10, and 11? Together do they help give a more clear vision of what the specific subject of the reading is? What are the externalized (physical and material) influences of cards 2, 6, 7, 12 and 13? How do other card triads positively and negatively influence each other? Do any of these influences make a “good” card negative or lessen the blow of a “bad” card? Do the suits of these cards strengthen or weaken each other?